Russia has been a net buyer of gold for the past few years. It bought about 77 tons in 2013 and currently holds around 1,042 metric tons in its vaults, making it the eight biggest gold investor of the world. But what will Russia do next with its gold, as the world appears to be on the brink of a renewed cold war? Russia steadily continued accumulating gold reserves. In 2007, just before the crisis, Russia had only about 12 million troy ounces. Now they’re topping 33 million troy ounces, an increase of 175% in six years time. On a per capita basis they are already pretty much on par with the US, but that’s not enough for the Russians: they want more. After the turmoil in Kiev in which 82 people were killed, Viktor Yanukovych was forced to resign as president of Ukraine. Parliament elected an interim president, but Russia rejected the new regime pointing at its “illegitimacy”. Surprisingly, Russia sold a tiny 500 kilograms of gold last month. Most probably, Russia sold some gold to increase its foreign exchange reserves. However, instead of selling gold, they got a better idea: hike the interest rate up and increase the “trading corridor” of the ruble so they have to sell less of their foreign reserves. This Russian sale of gold shouldn't change anything on the long term intentions of the Russian central bank regarding gold. In defence of the ruble, Russia's central bank raised interest rates from 5.5 percent to 7 percent. This rate hike was the biggest one-time increase since the Ruble crisis of 1998. It was a necessary adjustment, as Russia’s foreign reserves were in steep decline. Earlier, its foreign exchange reserves reached a three-year low of $490 billion on February 7. Russia hasn’t floated the ruble entirely. 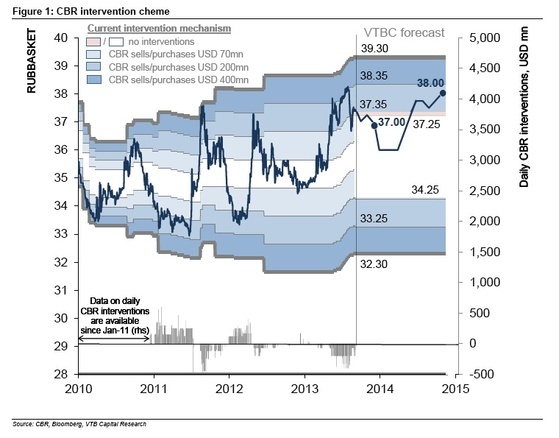 Similar to current Chinese policy with the yuan, it aims to maintain the EURRUB and USDEUR within strict boundaries. When the ruble drops below its lower limit, the Russian central bank intervenes by selling foreign exchange and buying rubles, to force its exchange rate back up again. The more the ruble dropped, the more the central bank needs to sell foreign currency holdings. However, with the geopolitical tensions this proved almost an impossibility given the outflows that Russia experienced the past months. The central bank was already planning to move to a free floating ruble by the end of 2014, but might be forced to soften the boundaries of its dollar and euro peg earlier than planned. Monday a telephone call was leaked in which Yulia Tymeshenko, now presidential candidate in Ukraine, said: “It’s about time we grabbed our guns and killed those damned Russians together with their leader.” Some argue that this is a move orchestrated by Russian intelligence to build a case for its intervention in Crimea, depicting Ukraine’s new leadership as hostile to Moscow. Putting aside theories and armchair speculation about who leaked this phone call, it does come at a convenient time for Putin. He will undoubtedly use this call as a justification of taking possession of Crimea. It will thwart the NATO’s ability to justify a military intervention in Ukraine. April 2014 & Onwards: Will Russia Dump Their US Treasuries in Exchange for Gold? Many gold investors have focused on the possibility that Russia would sell its US treasuries, triggering a sudden surge in American interest rates and causing stress in the bond market. An economic advisor to Putin has actually urged (private) Russians to dump their treasury holdings, although this certainly doesn’t mean the Russian central bank would sell theirs. With the geopolitical tensions currently at work, we should ask ourselves an important question: will Russia react on western trade sanctions by selling its US treasuries and buy gold? Such a scenario seems like a long shot. Russia needs their foreign reserves as gun power against depreciation against other currencies. It's in Russia's best interest to adhere as well as possible to its trading corridor, as borrowing costs for Russian companies increase as the ruble depreciates. Companies purchase equipment from abroad and when they borrow depreciating rubles, they need more of them to buy the necessary tools and equipment. Yet gold might go down no matter what Russia does with its gold reserves. Russia will most likely not sell any more gold. Russia will most likely not sell any US treasuries. The only way in which Russia will influence the gold price right now, is if a full-blown war erupts between the NATO countries and Russia. But nobody really wants war. The most likely scenario is that Putin will stay out of the limelight for a while, and everything ends with an anticlimax. Markets are now impatiently waiting to see fireworks, but it might turn out that nobody actually brought matches: gold already retracted a bit after reaching almost $1,400 per troy ounce on the threat of war and might retract further (price as of writing: $1,295). In addition, the IMF bailout for Ukraine approved yesterday will ease tensions around the Gazprom gas supplies. The bailout will make sure Gazprom gets paid for Ukrainian gas consumption in the meantime, assuring no significant supply disruptions to Europe. The bailout — which is in all likelihood lost money for its creditors — contributes to a further alleviation of recent geopolitical tensions in the short run. So, we have three unfavorable developments for gold right now: (1) the Russian anticlimax, (2) the continuation of ‘tapering’ by the FED and the suggestion that rates might be hiked sooner rather than later, and (3) positive, real interest rates in China. The Indian important restrictions are also still taking their toll; jewellers argue that a 35% drop in official Indian gold imports is realistic if the Indian government will not relax its restrictions and duties soon. The Indian government hasn’t budged so far, but opponents of the gold import restrictions are gaining ground. Fundamentals for holding (and buying) gold are still firmly in place. Savvy investors are advised to profit from further price falls to increase their exposure to gold.